What Good is Incognito Mode? - Ask Leo! Incognito mode, or Private or InPrivate browsing, protects your privacy to a point. It's critical to know where that point is. I use incognito mode in my web browser to keep my online activities private. I mentioned that to a friend and he said it wasn’t private at all. If he’s right … what’s the point? You’re both right, and you’re both wrong. 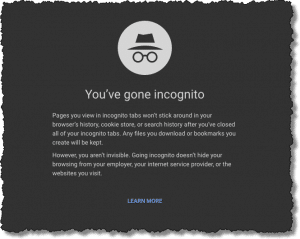 Incognito mode in Google Chrome (also referred to as “Private” or “InPrivate” in Firefox, Internet Explorer, Edge, and other browsers) protects your privacy to a point. It’s critical to know where that is, because beyond that point, Incognito does exactly nothing to keep you more private. The good news is that the point to which Incognito has effect, and beyond which it has no effect at all, is easy to understand. Incognito affects only the information stored in your computer. Information stored or seen elsewhere is completely unaffected by Incognito. 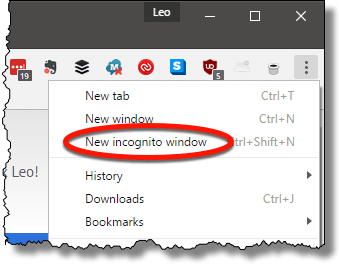 Entering Incognito mode varies based on browser, but in Chrome, click on the ellipsis menu at the right end of the menu bar, and click on “New Incognito Window”. Warning: Google Chrome cannot prevent extensions from recording your browsing history. To disable this extension in Incognito mode, unselect this option. Browser extensions are one way your activities can be exposed, so disabling them by default makes a lot of sense. You can then choose which extensions you trust. The history of websites you visited within Incognito windows (though any bookmarks you create will be retained). The history of files you’ve downloaded within Incognito windows (though the files themselves are left intact). The history of searches kept by the browser. Cookies left by the sites you’ve visited within Incognito windows. Form-fill information entered into Incognito windows that would normally be remembered for future auto-complete. The browser cache related to your Incognito activities. Any non-Incognito windows are unaffected. The idea is that once you exit an Incognito window, no trace of the activity that happened within that window is left on your computer. Incognito only affects the data that is kept on your PC. Your network traffic is unaffected. Your ISP can still see what you’re up to. The websites you visit have no idea you’re incognito. They can still identify you by various means not limited to cookies, and they can still keep a record of your visit. The search history saved in the online account you might have with the search provider, like Google, is not affected. Any malware on your machine can see what you’re up to. The bottom line is that Incognito (or Private or InPrivate) mode is great at preventing anyone with access to your computer from easily finding your activities there — but it does nothing to protect your online privacy. It certainly shouldn’t be considered as any kind of absolute privacy or security tool. Do Browser Features Offering Privacy Really Work? - Google Chrome offers Incognito mode, and IE8 offers InPrivate browsing. We'll look at how they work, and how private they really are. Does Restoring Windows 7 from a Backup also Restore XP Mode? - When you create a backup image of your machine, it contains everything; that’s the definition of a backup image. 1: This is highly implementation-dependent. Different browsers do things in different ways, ranging from not creating “files” at all, but keeping things in memory, to actually attempting a secure delete. The latter is not something I’d count on if it matters to you. TAGS: The Best of Ask Leo! « Previous post: What Does “Mailbox Unavailable” Mean and How Do I Fix It? I use Avast’s Safe Zone browser, do you recommend it? It has a bank mode for dealing with your bank and I think it is secure from anyone spying on it. Do you agree? I sure would appreciate your opinion. Do passwords usually work on browsers other than the ones they were set up on? It’s not clear what you mean by passwords on browsers. If it’s a website login, then yes. If it’s a password for the browser, than no. To a degree, yes, but the VPN knows all of the sites and has access to any non-HTTPS data flowing between them and the sites which you visit through them. Only to the point of the VPN service itself. After that – the sites you visit and the way the traffic makes it from the VPN service to those sites – remains as before. When using Firefox or Opera, you can easily start directly in private mode. All you need to do is to edit a shortcut to add « /private» at the end of the target. It’s highly probable that you can use something very similar with most browsers. Don’t bother; you will never remember, or be sure of exactly what is affected & what is not. It can certain seem that way. The better rule of thumb is simply this: incognito only affects what’s saved on your computer, period. Information seen or saved elsewhere is unaffected. if i watch something in incognito mode does video memory get erased after i close incognito browser? Can someone, except from isp etc, like my friends and family see my video memory if i watched something in incognito without having physical acces to my pc or instaling spying programms or something? Incognito mode wipes the browsing history from your computer. There shouldn’t be any traces on the computer except possibly in the Pagefile which would take a pretty sophisticated hacker to discover. could my family or friends acsess my pagefiles from their own pc? No. They’s have to get their hands on your computer and understand what looks like gibberish to most people. Most computer technicians couldn’t even decipher it. Does it protect airline sites from using your recent activity to judge your interest and thus try to charge you more? If not, how do we keep retailers from using our search activity against us? Nope. If that’s something that truly concerns you use an anonymizing service like TOR. Warning: it’ll be slower. Okay i’ve read somewhere that when using Chrome or Firefox to stream media files, it is not uncommon for them to use Windows Media to act as the streaming player – files with extensions such as .avi and .wmv. Only trouble is, Internet Explorer keeps a copy of these file names in the IE history, regardless of whether incognito mode was turned on in Chrome or not. I don’t know if that’s true or not and if it’s fixed but i have a few questions i would like answer on. I have cc cleaner and had a lot of temporary files from IE to clean. Is it because of all the videos i watched in incognito mode on chrome or could it be something else? I dont use IE. How long are temporary IE files stored? And if it’s not because of the videos what could have caused for me to have so many temporary IE files to clean? How long the files are stored depends on a few factors. I believe they stay until the space allocated for temporary files is full and the older ones are deleted to make space for the newer files. You can manually clear the cache and history by typing CRTL+SHIFT+DEL from most, if not all, browsers and then ticking the kinds of information you want to delete. Some browsers have a setting to delete all those upon exiting the browser. You can also run CC to accomplish that. CCleaner is probably the most thorough as it remove file from the Temp folder.